Creating a high converting landing page that beats all your competition in the market is certainly no walk in the park. There are thousands of things that need to be kept in mind while crafting it. The science of psychology, what your customers want, what you want, what results you are seeking and a lot more. That’s why you should be following some of the landing page best practices. So what does it really take to create landing pages that convert like magic for your business? Knowing that there is no such thing as ‘one size fits all’. There is absolutely no standard step-by-step manual to create a perfect landing page. Each landing page has a different purpose, based on what their business or marketing campaign goals are. They also have different call to actions (goals) for different audiences to cater to. No two businesses can have the exact same purpose, intent, product, pricing, messaging, value proposition or even a testimonial approach. * The headline must grab the reader’s attention in less than 5 seconds. * The headline should inform the reader what the product/service is about. * The headline should be as clear, concise and crisp as possible (ideally no more than 15 words). For example: MailChimp uses a pretty direct headline, ‘Send better email’ – that resonates with its target audience instantly. Three words and the visitor knows what they are about, their value proposition and it definitely does capture their attention! * The sub-headline must reinforce what the headline says in a persuasive manner. * The sub-headline must be slightly more in-depth than the headline. * If you’re stating a problem in the headline, make sure the sub-headline offers a solution. * The sub-headline is generally placed right below the main headline. 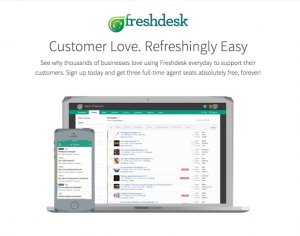 For example: Freshdesk supports its headline with a sub-headline that reassures the user of the technology by stating that a number of people are using it and assuring its ease of use. * Use oversized images as they are both aesthetically pleasing and boost conversion rates. * Ensure the visuals are relevant to your business, product or service. * The images used on the landing page must be of high quality and resolution. For example: Shutterstock itself makes use of a large, prominent picture on its landing page – it is relevant to what they offer and aesthetically maintains their marketing message. You now have their attention and have convinced them to stay. What’s next should be an explanation to why and what they are there for. If a user doesn’t understand your product or service, they are as good as lost. The best way to avoid losing them, is to be absolutely straightforward about what you offer. * Spin it around the headline. * Combine multiple elements like headline, sub-headline, image and separate paragraphs that explains further. * It should be focused around the user. * It should list down the benefits that the user will get from your products and services. For example: Crazy Egg simply lists down what the user can do with their technology and how it benefits them in the long run. You could have the highest quality content on your landing page and still lose prospects simply because the structure of your landing page is all over the place and your visitors couldn’t make any sense of it. Having a logical flow to your content keeps your visitor cognitively engaged and offers them a step-by-step process to follow till conversion. * Start with an explanation that lets the user know why they are there and then move on to listing the benefits. Follow this up with trust builders such as testimonials and then conclude it with your CTA. * Your placement of the CTA substantially influences the flow of the landing page. You can use multiple CTAs on a landing page – try positioning one at the end and some in-between the content in a discrete manner. If you want to encourage multiple actions through your landing page campaign with easy to implement CTAs, you can make use of tools like SalesPanda or Marketo. * You can use design to demarcate your content sections on the landing page. Doing so not only raises it’s visual appeal, but also the readability. * Test the length of the landing page – while shorter ones are known to work for a few businesses, long-form landing pages are generally more effective for persuasion. Here’s a human psychology fact that you should take into account for almost every marketing campaign – humans are wired to seek for the easiest ways to accomplish things. Discover the common pain points and the solutions you can provide with your products/services. * Mention what’s at stake along with what they will gain. * Include pain points and solutions you gave in customer testimonials. * Remember to directly address the problem and provide a solution. 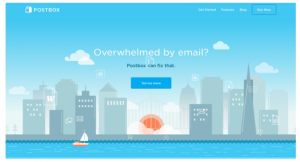 For example: Postbox uses the pain point of its target audience as the headline and directly mentions itself as a solution for the same. * Don’t just resolve the pain points previously mentioned, include emotional pleasure cues in it. * One of the goals of your landing page should be to show how customer can derive pleasure from buying your products/services. * Using both emotional and psychological pleasure will allow you to create a very compelling copy. For example: Reputation.com adds the element of pleasure and their value proposition right in their headline. So the visitor knows exactly what they are about, what they will gain and which pain point they are addressing with their services. * Include customer testimonials from everyday people, and not just influencers or experts. * Use pictures to give an identity to the people who give you reviews. Include their professional positions as well if possible. Doing so allows the visitors to draw parallels to the reviewers. * Include real numbers and data from your business insights that assure the delivery of the promises you make on your landing page. * Showcase popular brands that are using your product or service. Logos of famous brands are eye catching, easily recognizable and help greatly in building credibility. * Include a live social feed that displays what your customers are saying about you on social media. This showcases your openness and confidence in your product/service. For example: Fab Bag has included a live Twitter feed on their landing page, that shows what their customers are saying about them. A good way to prove to your customers that you care and showcase your commitment to supporting them is to include your contact information on the landing page. It is important to let your audience know that you’re always within reach via multiple means – phone numbers, email addresses, a physical address, social profiles and contact forms, or even live chat. For example: Tasks EveryDay has a simple contact form for people who want to know more about their product and aren’t sure how they can integrate it into their daily processes. A guarantee – irrespective of what it is, helps reassure people about interacting with your business. Providing a guarantee on the landing page improves the likelihood of a conversion. Some of the most oft-used guarantees promised by businesses across different industries include promises of satisfaction, money back guarantees, an anti-spam policies, promises that add more value to the USP, etc. Positioning your guarantee close to your call-to-action can serve as the final persuasive nudge to convert a prospect into a customer. For example: Help Scout places its guarantee of free training, 99.99% uptime and security policies right below their call-to-action, to reassure their visitor about choosing them. * Use a compelling copy and ditch the boring ‘click here’ buttons. * Make the button larger in size compared to the other elements. * Use a contrasting color from your website’s theme to draw attention (but remember to not make it look too out of place). For example: SalesPanda uses an orange call-to-action button that says, ‘Show me live’ – the copy not just suggests a unique action, but also compliments both the headline and the explanation, while also standing out from the rest of the design. If you manage to nail these twelve elements, we’re certain your landing page will already be head and shoulders above the majority of your competition. Is there an element that we missed that you think belongs on a landing page? Enlighten us by dropping your suggestions in the box below!